Boston Terrier Gifts dog coats and dog raincoats just right for the Boston Terrier dog. Boston Terrier dog coats and rain coats will keep your Boston warm and cozy in cold weather. 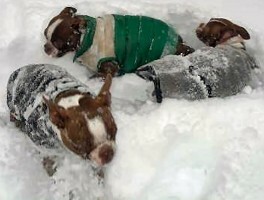 Dog coats protect your Boston Terrier from rain, snow, and wind. Our dog coats and raincoats come in many colors and styles to accomidate a variety of tastes. They are stylish as well as protective. 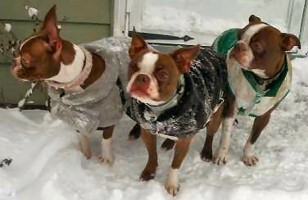 Be sure your Boston Terrier has his or her dog coat on when you go out into the cold. Click on the pictures below to see a larger picture of that praticular Boston Terrier Coat. Snowtime Fun is best in a good dog coat!